One of the principal links between China and Hong Kong, Shenzhen is one of the wealthiest and most sought-after locations on the southeastern border of China in the Guangdong province. It is not only a hub for multinational corporations and tech graduates, but it is also a great attraction from migrants, both Chinese as well as expats. With a whopping growth rate of over 50 times in the past 40 years and its population of 20 million, Shenzhen continues to attract individuals from all over the world to experience its vibrant cityscape and its buzzing nightlife. Shenzhen is the 7th largest city in China and houses some of the largest buildings in China. Whether it is the parks, beaches or mountains of Shenzhen or its exceptional cuisine, it is surely one city that you want to live in! As the richest city of China, Shenzhen obviously boasts some heavy prices when it comes to real estate. Home sales are on a perpetual rise, and thus, there is no better time to invest in property or sign a rental agreement than the present. But worry not about navigating your way through the sea of high-priced rentals in Shenzhen FlatinChina has got you covered for all sorts of real estate needs. Whether you are looking to rent Apartments in Shenzhen, rent Serviced Apartments, rent a room in a shared apartment or rent an office in Shenzhen we’ll connect to your ideal option in no time. With our advanced online search tools, you can filter your searches to get narrowed results that fit your requirements and suitability. You can search through a wide range of accommodation including different types of rentals, shared rooms, shared apartments, serviced apartments, compounds and both long-term and short-term rentals in the amazing city of Shenzhen! Futian The business center of Shenzhen, especially electronic products, a tech geek’s paradise. Best location for Expats who want to live in Shenzhen. Luohu Typical Chinese neighborhoods, excellent skyscrapers. Exceptional cuisine and shopping destinations. Good location for Expats in Shenzhen. Yantian Quieter neighborhoods near the beach, away from the buzz of the city center. Good location for families with children. Longgang Cheaper accommodation in the industrial areas away from the city center, mountain recreational activities and good western food. Pingshan Pingshan is home to several parks, has beautiful scenery, fresh air, and ideal living conditions for Expats coming to Shenzhen. Longhua Home to many factories and companies, it is one of the main production bases in Shenzhen and is ideal for living on a budget. Singles Futian CBD The hub of Shenzhen is ideal for single professionals who want to experience the nightlife. Families Shekou, Nanshan A selection of kids friendly neighborhood and an abundance of international schools within walking distance. Students Bao’an, Longgang Cheap, quieter areas away from the CBD (Central Business District). Choosing where to live in a city is a decision that is guided by a multitude of factors and dictated by a range of possibilities. It is that one decision that can affect various aspects of your living, most importantly including your cost of living and your lifestyle in general. Let us take a look at all the different areas in Shenzhen and how they suit more to a particular set of residents than the other. The Central Business District (CBD) in Futian is hands down the most glamorous and attractive area in all of Shenzhen. But of course, with all this splendor and sparkle come the exorbitantly high Shenzhen housing prices. This especially makes the CBD (Central Business District) area ideal for single professionals and other expatriates with good paychecks. In this area of Shnezhen you can find many luxury apartments. The city hubbub is ideal for nights out partying, and business is never far away. 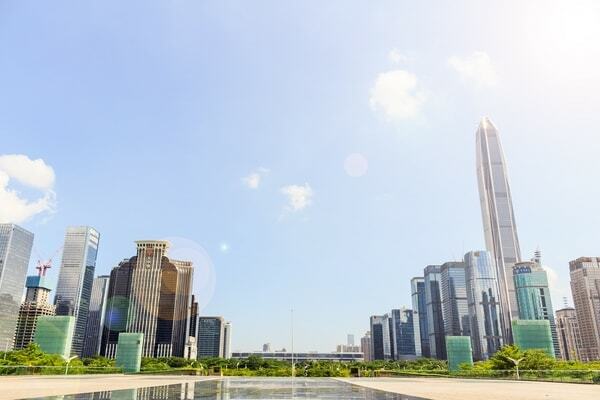 With great transport and recreational facilities available, there never is a dull day in the CBD of Futian, Shenzhen. For families to settle into a new neighborhood, there are even more complications involved, and considerations to me made. Whether you are looking for good apartment complexes with expatriate communities, good international schools nearby or kid-friendly parks in the neighborhood, your hunt for the perfect accommodation in Shenzhen can be a tiring one. But don’t worry! With FlatinChina’s advanced search tools and hundreds of available options, you can easily find the ideal accommodation for yourself in no time. As a student, budgets can be pretty tight, and the affordability of a residence in a popular area for a reasonable price is next to impossible. For this reason, a student must look for renting an apartment in the quieter, less lively neighborhoods of Shenzhen. The Bao’an and Longgang districts are particularly ideal for students who want to study in Shenzhen. Although one has to live away from the glamorous parts of the city, it provides a tranquil and serene atmosphere perfect for Expat students in Shenzhen. So what are you waiting for? Whip out your phones and get searching for your ideal accommodation in Shenzhen right away! Our search engine tools will help you easily locate and view properties that match your budget and needs. Rent prices in Shenzhen vary greatly depending on the area you choose to live in. It is obvious that the areas that lie close to the commercial areas and the city center will fare much higher than the apartments farther away from the business hubs. Similarly, certain districts in Shenzhen have much higher rental prices than others. These include Futian, Luohu, and Nanshan. The cost of living is particularly determined by the biggest chunk of your earnings or savings which goes to rent an apartment in Shenzhen. Several other determinants come into play to decide your total cost of rent. Whether you want a luxury apartment or a simple student room, whether you want to live in a posh neighborhood or an ordinary settlement, whether you’re moving with family or living alone as a single. The more populated areas are much more popular amongst the locals and expats, and therefore, will naturally cause a greater dent in your pockets. Moving farther away from these areas allows for a great dip in Shenzhen rent prices. The housing you choose all depends on your budget and your needs. Single professionals with good salaries can choose to rent apartments and serviced apartments in the Central Business District (CBD) of Shenzhen, which is the ideal option for them, whereas students looking for more affordable accommodation should get move away from these thickly populated areas to find more reasonable options for themselves. Shenzhen housing - How do you want to live? The type of apartment in Shenzhen that you choose can depend on any or more of these factors. Or it could be something entirely different, according to your situation. There is a wide range of rental options available in Shenzhen to choose from. You can opt for quieter, tranquil areas or rich roaring, sparkling cityscapes. You can go for open plan luxury apartments or go for a room in a shared apartments in Shenzhen, long term rentals or short term rentals, serviced apartments or family units; it all depends on your needs, and obviously, your financial resources. One of the more luxurious options for staying in Shenzhen is to choose a serviced apartment. Serviced apartments are a rather interesting form of rental accommodation in Shenzhen. Serviced apartments in Shenzhen are much cheaper than hotels but cost more than regular apartments. The experience of living in one is similar to residing in a hotel but for quite a long time. A range of facilities and amenities are available for residents to use. These include but are not limited to daily housekeeping, swimming pool, gym, free breakfast, children’s area, health assistance, concierge service, and parking space. Thus, serviced apartments in Shenzhen are the perfect option for you if you are a single professional worker who is muddled up in work and social activities. Some of the most famous serviced apartment complexes of Shenzhen are located in Futian and Nanshan, the populated business districts of the infamous city. The most famous Serviced Apartment in Shenzhen are Fraser Suites, The Clouds Apartments, Bennelong Residence Shenzhen and Savills Residence. Apartment compounds are a great residential option if you are considering moving to Shenzhen with your family. Apartment compounds form close, tight knitted communities that help shape families and encourage social interactions in a very healthy and positive manner. A good apartment compound in Shenzhen will have lower noise levels, a range of apartments for you to choose from, friendly residents and recreational facilities for families such as tennis courts, gyms, swimming pools, playgrounds, 24-hour security and parks nearby or within the compound premises. The best apartment complexes in Shenzhen can be found in Shekou in the Guangdong district. If you are looking to rent a modern apartment in an apartment compound in Shenzhen have a look at the Peninsula Compound, Jing Shan, Splendid Garden, Mangrove Bay or Coastal Rose Garden in Shenzhen. Shared apartments in Shenzhen or a room in Shenzhen is a very good option, particularly for students and interns in the area. Sharing an apartment with another can help you save up to 50% or more of the money that would have otherwise gone to rent. Many students and young professional in Shenzhen rent a shared apartment in the city center. The upside of living in a shared apartment is that with the divided rent, you can now afford to live in an apartment in the posher and popular areas of Shenzhen or go for an accommodation with a more luxurious interior or open plan. Long term rentals can be hard to come by in China. Most of the contracts for apartments in Shenzhen are for six months or one year only. However, longer contracts for 5-10 years, although rare, can be found through extensive research and findings. It must be kept in mind that a better price can be negotiated for a long-term rent apartment as compared to a short term contract. Unlike the long-term rentals that are rare to come by in Shenzhen, short term rentals are readily available. And thus, one can afford to be picky when it comes to finding an apartment in Shenzhen on a short-term lease. Usually, these leases are for about three, six or twelve month, during which time the rent remains static and cannot be increased. Short term apartments in Shenzhen can be rented on monthly or weekly bases are also available. Look according to your duration of stay and make sure to negotiate a good deal for yourself. On FlatInChina you can also find many short term apartments in Shenzhen. How do I find a cheap apartment in Shenzhen? The rule is simple: the farther the accommodation is from the Central Business District of Shenzhen, the cheaper it will be. The more populated areas that attract the most tourists, expats, and locals, as well as business, are bound to have an upward surge in their prices. If you are looking for a more reasonably priced accommodation in Shenzhen, you should look in the developing neighborhoods and districts as well as the quieter settlements that are further away from the hubbub. It is truly surprising how only a little distance from the Central Business District (CBD) can make so much difference in the rental prices, in these areas outside of the CBD it is easy to find a cheap apartment in Shenzhen. Do not wait! Start your search now on FlatinChina to find the ideal accommodation in the most suitable location in Shenzhen for yourself in every way!